A resistor is a two-terminal electrical or electronic component that resists the flow of current, producing a voltage drop between its terminals in accordance with Ohm’s law. The electrical resistance is equal to the voltage drop across the resistor divided by the current that is flowing through the resistor. Resistors are used as part of electrical networks and electronic circuits. In general, a resistor is used to create a known voltage-to-current ratio in an electric circuit. If the current in a circuit is known, then a resistor can be used to create a known potential difference proportional to that current. Conversely, if the potential difference between two points in a circuit is known, a resistor can be used to create a known current proportional to that difference. Current-limiting. By placing a resistor in series with another component, such as a light-emitting diode, the current through that component is reduced to a known safe value. An attenuator is a network of two or more resistors (a voltage divider) used to reduce the voltage of a signal. A line terminator is a resistor at the end of a transmission line or daisy chain bus (such as in SCSI), designed to match impedance and hence minimize reflections of the signal. All resistors dissipate heat. This is the principle behind electric heaters. The SI unit of electrical resistance is the ohm. A component has a resistance of 1 ohm if a voltage of 1 volt across the component results in a current of 1 ampere, or amp, which is equivalent to a flow of one coulomb of electrical charge (approximately 6.241506 × 1018 electrons) per second. The multiples kilohm (1000 ohms) and megaohm (1 million ohms) are also commonly used. In an ideal resistor, the resistance remains constant regardless of the applied voltage or current flowing through the device or the rate of change of the current. While real resistors cannot attain this goal, they are designed to present little variation in electrical resistance when subjected to these changes, or to changing temperature and other environmental factors. A resistor has a maximum working voltage and current above which the resistance may change (drastically, in some cases) or the resistor may be physically damaged (overheat or burn up, for instance). Although some resistors have specified voltage and current ratings, most are rated with a maximum power which is determined by the physical size. Common power ratings for carbon composition and metal-film resistors are 1/8 watt, 1/4 watt, and 1/2 watt. Metal-film and carbon film resistors are more stable than carbon resistors against temperature changes and age. Larger resistors are able to dissipate more heat because of their larger surface area. Wire-wound and resistors embedded in sand (ceramic) are used when a high power rating is required. Furthermore, all real resistors also introduce some inductance and a small amount of capacitance, which change the dynamic behavior of the resistor from the ideal. Some resistors are cylindrical, with the actual resistive material in the centre (composition resistors, now obsolete) or on the surface of the cylinder (film) resistors, and a conducting metal lead projecting along the axis of the cylinder at each end(axial lead). 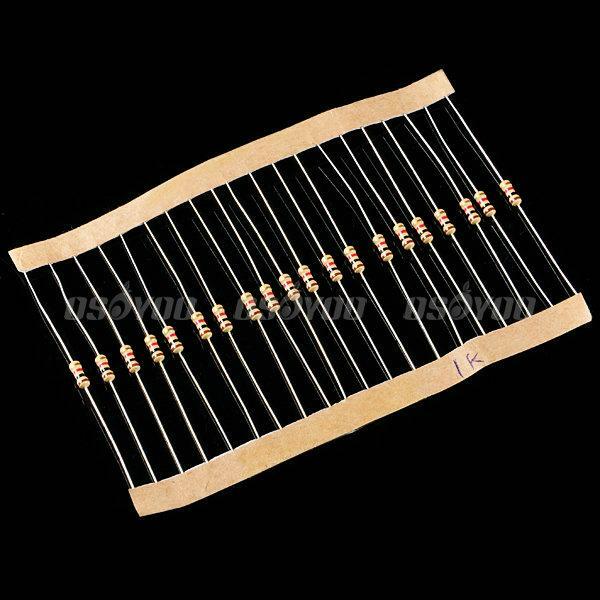 There are carbon film and metal film resistors. The photo above right shows a row of common resistors. Power resistors come in larger packages designed to dissipate heat efficiently. At high power levels, resistors tend to be wire wound types. Resistors used in computers and other devices are typically much smaller, often in surface-mount packages without wire leads. Resistors are built into integrated circuits as part of the fabrication process, using the semiconductor as the resistor. Most often the IC will use a transistor-transistor configuration or resistor-transistor configuration to obtain results. Resistors made with semiconductor material are more difficult to fabricate and take up too much valuable chip area. The variable resistor is a resistor whose value can be adjusted by turning a shaft or sliding a control. These are also called potentiometers or rheostats and allow the resistance of the device to be altered by hand. Rheostats are for anything above 1/2 watt. Variable resistors can be inexpensive single-turn types or multi-turn types with a helical element. Some variable resistors can be fitted with a mechanical display to count the turns.
. This 2kW rheostat is used for the dynamic braking of a wind turbine. Variable resistors can sometimes be unreliable, because the wire or metal can corrode or wear. Some modern variable resistors use plastic materials that do not corrode and have better wear characteristics. a rheostat: a variable resistor with two terminals, one fixed and one sliding. It is used with high currents. a potentiometer: a common type of variable resistor. One common use is as volume controls on audio amplifiers and other forms of amplifier. A metal oxide varistor (MOV) is a special type of resistor that changes its resistance with rise in voltage: a very high resistance at low voltage (below the trigger voltage) and very low resistance at high voltage (above the trigger voltage). It acts as a switch. It is usually used for short circuit protection in power strips or lightning bolt “arrestors” on street power poles, or as a “snubber” in inductive circuits. A Positive Temperature Coefficient (PTC) resistor is a resistor with a positive temperature coefficient. When the temperature rises the resistance of the PTC increases. PTCs are often found in televisions in series with the demagnetizing coil where they are used to provide a short-duration current burst through the coil when the TV is turned on. One specialized version of a PTC is the polyswitch which acts as a self-repairing fuse. A Negative Temperature Coefficient (NTC) resistor is also a temperature-dependent resistor, but with a negative temperature coefficient. When the temperature rises the resistance of the NTC drops. NTCs are often used in simple temperature detectors and measuring instruments. A sensistor is a semicondutor-based resistor with a negative temperature coefficient, useful in compensating for temperature-induced effects in electronic circuits. Light-sensitive resistors are discussed in the photoresistor article. All wire, except for superconductors, exhibits some resistance, based on its cross section area and the conductivity of the material it is made of. Most axial resistors use a pattern of coloured stripes to indicate resistance. SMT ones follow a numerical pattern. Cases are usually brown, blue, or green, though other colours are occasionally found like dark red or dark gray. 4 band identification is the most commonly used colour coding scheme on all resistors. It consists of four coloured bands that are painted around the body of the resistor. The scheme is simple: The first two numbers are the first two significant digits of the resistance value, the third is a multiplier, and the fourth is the tolerance of the value. Each colour corresponds to a certain number, shown in the chart below. The tolerance for a 4-band resistor will be 2%, 5%, or 10%. Note: red to violet are the colours of the rainbow where red is low energy and violet is higher energy. 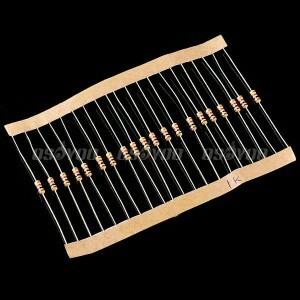 Resistors use specific values, which are determined by their tolerance. These values repeat for every exponent; 6.8, 68, 680, etc. This is useful because the digits, and hence the first two or three stripes, will always be similar patterns of colours, which make them easier to recognize. Closer tolerance resistors, called precision resistors, are also available. 5-band identification is used for higher tolerance resistors (1%, 0.5%, 0.25%, 0.1%), to notate the extra digit. The first three bands represent the significant digits, the fourth is the multiplier, and the fifth is the tolerance. 5-band standard tolerance resistors are sometimes encountered, generally on older or specialized resistors. They can be identified by noting a standard tolerance color in the 4th band. The 5th band in this case is the temperature coefficient. Surface-mount resistors are printed with numerical values in a code related to that used on axial resistors. Standard-tolerance SMT resistors are marked with a three-digit code, in which the first two digits are the first two significant digits of the value and the third digit is the power of ten. For example, “472” represents “47” (the first two digits) multiplied by ten to the power “2” (the third digit), i.e.
. Precision SMT resistors are marked with a four-digit code in which the first three digits are the first three significant digits of the value and the fourth digit is the power of ten. The operational temperature range distinguishes commercial grade, industrial grade and military grade components. where V is the voltage across the object in volts (in Europe, U), I is the current through the object in amperes, and R is the resistance in ohms. (In fact this is only a simplification of the original Ohm’s law – see the article on that law for further details.) If V and I have a linear relationship — that is, R is constant — along a range of values, the material of the object is said to be ohmic over that range. An ideal resistor has a fixed resistance across all frequencies and amplitudes of voltage or current. Superconducting materials at very low temperatures have zero resistance. Insulators (such as air, diamond, or other non-conducting materials) may have extremely high (but not infinite) resistance, but break down and admit a larger flow of current under sufficiently high voltage. All three equations are equivalent, the last two being derived from the first by Ohm’s Law. If the average power dissipated exceeds the power rating of the resistor, then the resistor will first depart from its nominal resistance, and will then be destroyed by overheating. However, many resistor networks cannot be split up in this way. Consider a cube, each edge of which has been replaced by a resistor. For example, determining the resistance between two opposite vertices requires matrix methods for the general case. However, if all twelve resistors are equal, the corner-to-corner resistance is 5/6 of any one of them. Resistors are commonly made by winding a metal wire around a ceramic, plastic, or fiberglass core. The ends of the wire are soldered to two caps, attached to the ends of the core. The assembly is protected with a layer of paint, molded plastic, or an enamel coating baked at high temperature. The wire leads are usually between 0.6 and 0.8 mm in diameter and tinned for ease of soldering. Foil resistors have had the best precision and stability ever since they were introduced in 1958 by Berahard F. Telkamp. One of the important parameters influencing stability is the temperature coefficient of resistance (TCR). Although the TCR of foil resistors is considered extremely low, this characteristic has been further refined over the years. Electronics and Communications Simplified by A. K. Maini, 9thEd., Khanna Publications (India).